Ram Dass. (1971). Be here now. New Mexico: Hanuman Foundation. I find this question tricky to answer… I am a self-professed lover of printed books (the whole look, feel, smell – sensory interaction thing). I find it nearly impossible to read texts through a screen (whether computer or e-reader). This bias is hard to avoid when it comes to evaluating the relationship between a text’s form and its meaning. I have a large home library – for me, printed, physical, very ‘present’, non-virtual books, they carry weight. They take up space, they have an emotional significance, and they are invested with meaning and memory. 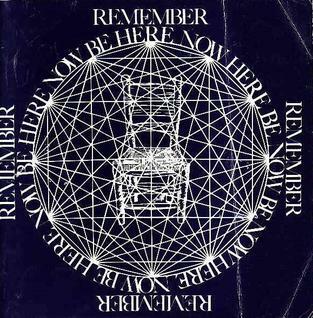 Almost no book more so than my copy of Ram Dass’ Be Here Now. Heavily used, well-loved, traveled, annotated, dog-eared, and bookmarked – it stands as a testament to my own personal and spiritual development over many years. When I see its iconic blue cover, I can remember glancing at it for the first time in Seekers Books on Bloor. The shredded bits of paper ephemera mark pages that have had particular resonance for me, some of which I have photocopied and pasted onto walls of houses past. The middle section of the book, the thickest and most substantial, is recognizable by its illustrations printed on brown craft paper. The pages themselves are tactile – they have texture, roughness, weight. They flip and unfold. The pages of my copy have warped with moisture over time, giving them additional dimension. To read this section, the book must be turned vertically, and read like a scroll – with text and image blending seamlessly across both pages. Reading this book is an immersive experience. Amazon tells me that you can purchase Be Here Now in e-book form, as an ‘enhanced edition’, including guided video meditations, a video retrospective of Ram Dass’ journey, as well as a copy of the first chapter of his latest book, Be Love Now. I guess the issue here is this – I can’t imagine the physical form of this book being easily replicated in digital form, considering what would be ‘lost’. Perhaps this comes back to the issue, as Johanna Drucker puts it, to do with e-book design itself: “rather than thinking about simulating the way a book looks, then, designers might do well to consider extending the way a book works” (2009, 166). So, how would Be Here Now work digitally? Or, to put it differently, since it clearly already exists in digital form – how would it work for me? My web browsing has led me to a website where someone has scanned and uploaded each individual page of the book, and so, rather than flip through successive pairs of pages, the reader can simply scroll continuously (see: http://beherenow.dc7.us/corebook00.htm#THE HEART CAVE) – how does this affect/effect a different meaning? I was fascinated to read Matthew Kirschenbaum and Sarah Werner describe the symbiotic potential between digital and physical forms of book production: “digital media cohabitate with the codex, not just in close physical proximity…but occupying conceptually coterminous textual and narrative space” (2014, 443). They note, too, that computers are “responsible for key aspects of what we might think of as a widespread renaissance in the appreciation of the book as material object” (2014, 445-446). Similarly, Drucker suggests that “by looking to scholarly work for specific understanding of attitudes toward the book as literal space and virtual espace, and to artists and poets for evidence of the way the spaces of a book work, we realize that the traditional codex is also, in an important and suggestive way, already virtual” (2009, 174). Claims such as this help disrupt and broaden my understanding of the terms ‘physical’, ‘literal’, ‘virtual’, or ‘digital’, and what constitutes a ‘book’ or ‘bookishness’. While I can’t imagine my experience with this text as distinct from the physical form that holds and delivers it, I can begin to think in new ways about how exactly Be Here Now communicates meaning, and how – while my own experience of it is deeply personal – through reading it in different systems and platforms, new readers might encounter a completely different effected/affected meaning – and I concede, that’s kinda neat. Hi Marlena, this post really piqued my interest, and not just because I share your passion for Ram Dass (and Seekers Books too!). Just last week I was showing my boyfriend the “Love, Serve, Remember” video about Ram Dass and Maharaji, which I saw for the first time when I was doing my yoga teacher training in Bali. Since I saw it at such a pivotal time in my life, it carries great meaning and emotional attachment for me, and whenever I think of Ram Dass I think of that video. Thanks for your comment! I like the idea of showing love serve remember as an accompaniment. I wonder – would it act as an introduction? or something to help supplement the reading in some way? in which case, what time is it ‘brought in’? I like the idea, too, of putting digital media on a printed page. I wonder how encountering the video in that context might mediate the experience of interacting with the physical book? This all reminded me of something that I forgot to touch on in the post, which is that, when it was originally created, ‘Be Here Now’ started off as a box, called ‘From Bindu to Ojas’, which included component printed sections of what went into the paperback book (like ‘Cook Book for a Sacred Life’, and the main section ‘From Bindu to Ojas’ itself) – but also photographs of gurus and saints, spiritual quotes to be cut out and pasted around, and even a kirtan record! In some ways, these all functioned as ‘hyperlinks’ do now – creating an immersive and interactive composite experience. I guess this is also what the ‘enhanced’ e-book edition is also attempting (and perhaps succeeding?) to recreate in some ways. On an extra level – pretty cool that this website exists and can (albeit in a different, digital form) simulate the experience of accessing the book in its original (and limited edition) incarnation. You can even listen to the album: http://frombindutoojas.com/record.html (complete with the vinyl ‘snaps’ and ‘crackles’). It’s like going down the rabbit hole! Thank you so much for sharing these links! What a lovely rabbit hole to go down. I am really fascinated by the notion of the ‘Be Here Now’ box; it is like a treasure chest of spiritual artifacts, and really brings to life the idea of books as objects. Your likening of these different elements to “hyperlinks” is spot on, but how do they function differently than hyperlinks when they are physical objects? Specifically non-book objects which we might post around the house or listen to on the record player. These are things that we interact with physically and not just intellectually. If you have something pinned up on the wall, like you did with your photocopied pages of ‘Be Here Now,’ and the “spiritual quotes to be cut out and pasted around” from the ‘From Bindu to Ojas’ box, you are seeing that day in, day out, and really engaging with it in a long-lasting, meaningful way. It creates a sort of imprint in your mind that you would not necessarily get from a digital text which disappears when you close an app and shelve your tablet. (On a side note: Do other people keep their tablet on the bookshelf like I do? What meaning can we glean from this?) In conclusion, I think that the format of the “box book” of mixed media and objects opens a lot of doors when thinking about enhancing digital objects, whereas the purely textual “codex book” might limit our understanding of functions and therefore restrict how we create a digital form.